It may often seem that our cats are living in their own world and couldn’t be at all bothered by ours. They like to go their own way. However, if truth be told, they do still need a few things from us so that we can pamper and adore them in the manner to which they are accustomed. If you have a finicky furbaby, you might find some inspiration here! 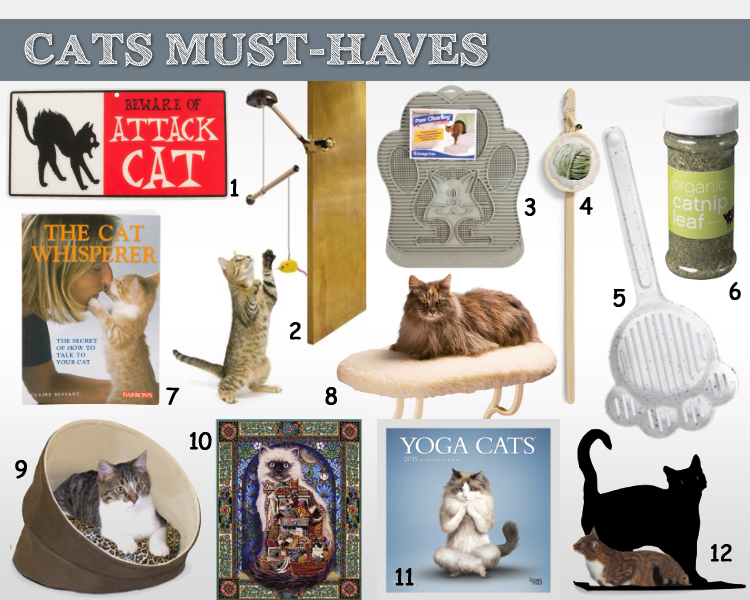 My favorite is the Yoga Cats Calendar, but that Heated Window Sill Bed would make for a very fortunate feline indeed. I love that yoga cats calendar! We have 3 kitties and they are most definitely pampered! We have two cats we love, a very old one and a very young one. Keeping the young one entertained sometimes feels like a full time job. This reminded me to get her more toys. I hadn’t seen the door one before! I have an outdoor cat and I just know she’ll love the kitty cave. Omg these are too funny & cute. I’m a dog gal but love cats too. All of these look great! My cats would be so happy. I know I want #1, #2, #9 & #12. I’d like to put the “BEWARE of CAT” sign on the back door (to replace “Beware of Dog” sign! The Kitty Cave is fabulous ~ I’m just afraid they might be too big (and fat) to fit in it (although they somehow manage to squeeze smallish boxes when they are determined to…! And finally, I love the Cat Shelf. I KNOW both of our kitties (a White one and a Black Tuxedo cat) weigh way too much for those delightful shelves but they’d be very cute on my office wall. My cat would love these, thank you for sharing with us!!!! I myself do not have cats (I am a dog mom) but I have friends who are cat parents. Thank you for sharing. My cat would love a heated window sill pad. Talk about pampering! My daughter has a long haired orange kitty and he is so special! He loves to where little outfits and he loves being put outside on his harness! He is so sweet and he loves catnip so I know he would love the catnip shaker! He would also love the heated window sill bed!! Some of these are adorable! I really like paw cleaning litter mat.That’s an awesome idea.Thank you.